Price: EURO 15.00 (inc. tax & shipping expenses) After hearing an amazing opera A Dog’s Heart by Aleksander Raskatov, directed by Simon McBurney some years ago, Tomoko asked Raskatov if he could compose a new piano concerto for her. He created 12 very vivid movements of colourful piano concerto, called _Night Butterflies_. The Seattle Symphony Orchestra and the Residentie Orkest of The Hague gave the commission and performed the piece in 2013 and 2014. 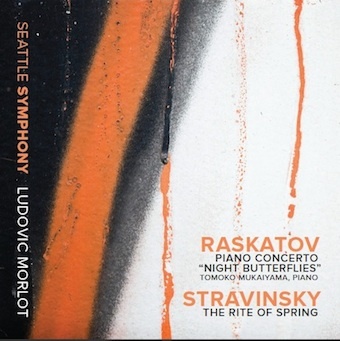 The Seattle Symphony Orchestra recorded the work and complemented the CD with Stravinsky’s Rite of Spring. [Mukaiyama’s] spectacularly vivid performance emphasized the composer’s extremities of gesture — ostinatos that crystallize into earworms, outbursts crushing in their violent force, vertiginous glissandi … but also conveyed the surreal cumulative effect of this abundance of contrasts.” Conceived after visiting a greenhouse in France inhabited by different species of butterflies as well as plants, Raskatov was reminded of a childhood walk in the forest near Moscow. The musical butterflies and orchestral soundscapes are varied and carry influences of Messiaen, Mussorgsky, Webern and Stravinsky, yet display Raskatov’s original sonic imagination. [...] The fascinating interweaving of the piano with the orchestra shows Raskatov to be a strong colorist, a master of textures, and a dynamic manipulator of rhythms, characteristics that make the pairing with The Rite of Spring especially appropriate. Mukaiyama's spectacular playing and the skillful accompaniment of Ludovic Morlot and the Seattle Symphony make this concerto a fitting opener for the program.